Not always do you come across a film that has its heart in its place and teaches us a lesson in the same vein. Rainbow Jelly does all that and more. 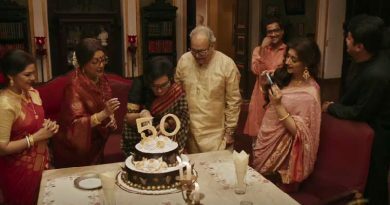 The film has hope written all over it, and by the time the end credits roll, you can’t help but nod in approval that this is certainly one of most hard hitting films to appear on the Bengali screen in the past few years. At the core of the film is Ghoton (Mahabrata), a differently-abled child who stays with his abusive uncle (Kaushik). Ghoton suffers in silence and retreats to his room whenever he finds time to forget his wretched life. His only friends are the local tea stall owner (Shantilal) and the girl next door Poppins (Anumegha). He paints, he conjures a world of fantasy, and he communicates with his dead parents, hoping for a better life. And then, one night, Poripishi (Sreelekha) bursts on to the scene to relieve Ghoton of his miseries by cooking seven delicacies to win over his uncle and unlock a secret. The entire cast of Rainbow Jelly returns a stellar performance. But it’s Mahabrata who takes the cake in every scene that he appears. A special child himself, Mahabrata gets under the skin of Ghoton, and stuns the audience in an unabashed debut. The scene where he vomits after being forced to eat stale vegetables, and then looks up with all the egressed food stuck outside his mouth to watch a flight cross the sky, leaves you spellbound. Rainbow Jelly is not a children’s film. Rather, it’s a tight slap on the face of grownups, who impose their scheme of things on a child in premature expectations to make adults out of them. The opening of the film will tell you that it’s a tribute to Leela Majumdar. But Rainbow Jelly is also a tribute to her equally famous nephew whose handling of child actors still remains unparalleled in world cinema. A torchlight, a villainous name, and a paper crown bear testimony to all that. Rainbow Jelly is a celebration of innocence. Rainbow Jelly is a celebration of friendship. Rainbow Jelly is a celebration of the triumph of good over evil. But perhaps, more importantly, Rainbow Jelly is a celebration of honest independent cinema. ← Goopy Gyne Bagha Byne Franchise Going the Byomkesh Way?